I know it's rainy and everything but it's Throwback Thursday as well! One thing we'll never miss every summer are those cold treats that helped us stay refreshed during the season's scorching heat. However, I'm not really into Halo-Halo for the reason that I don't like almost half of the ingredients - monggo, white beans, kaong, nata de coco, and macapuno. 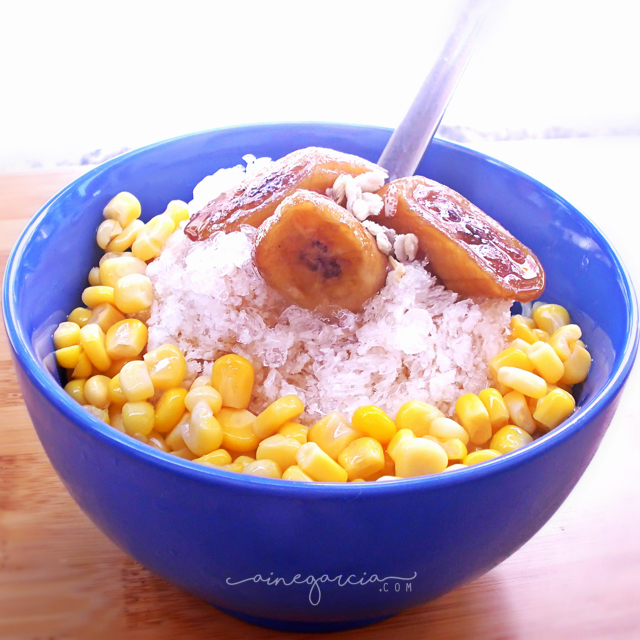 So I'm always a big fan of Mais and Saba or Saging con Hielo. But then, because of the summer heat, 1 serving is not enough for me and that means I have to spend Php50-60.00 every day just to have a yummy cool refreshment-slash-dessert. Thankfully, my mom and I went for a quick trip to Divisoria and found a hand-held ice shaver - just like when I was a kid where my mom used to do a mano y mano with the ice using the hand-held shaver. For some reason, it's durable compared to electric ice shaver (at least as to what we have experienced). So here it is, enjoy my favorite cool summer treat!